All English speech sounds are made on an outgoing (egressive) airstream. The process begins as air from the lungs (pulmonic air) passes upwards through the windpipe (trachea) and through the larynx. Within the larynx are two vocal folds. These are almost triangular in shape and made of elastic tissue. They are approximately 17-22 mm long in adult males and about 11-16 mm long in adult females. The space between the folds is called the glottis. If the vocal folds are held lightly together as the air passes through they will vibrate. This vibration is known as voicing and any speech sounds produced whilst the vocal folds are vibrating are said to be voiced. In contrast, if the vocal folds are held apart as air from the lungs passes through they do not vibrate. 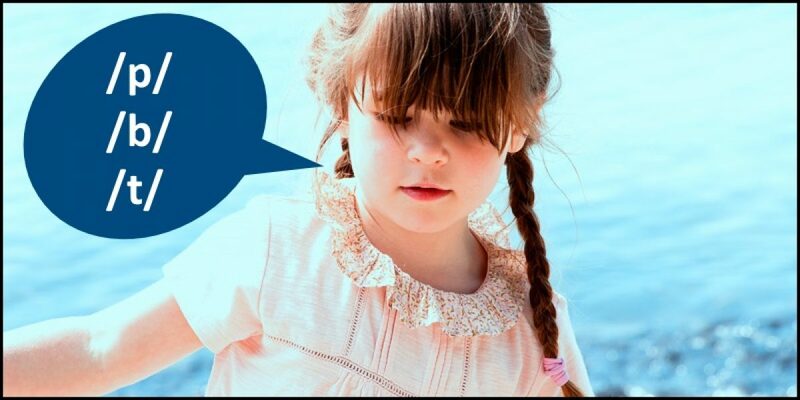 Any speech sounds produced without vibration of the vocal folds are said to be voiceless. As the airstream continues upwards and out of the larynx it enters the vocal tract. 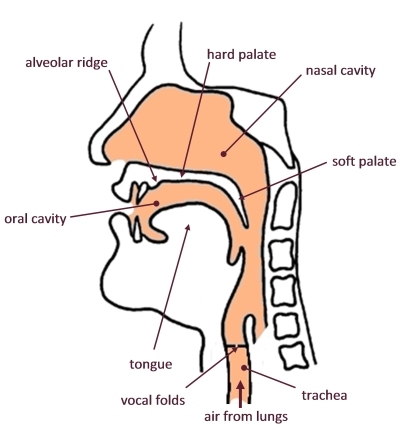 The vocal tract consists of the air passages above the larynx (Figure 1). There are two main cavities: the nasal cavity and the oral cavity. The nasal cavity is separated from the oral cavity by the roof of the mouth (the palate). The palate is, therefore, both the floor of the nasal cavity and the roof of the oral cavity. The front portion of the palate is a bony structure, known as the hard palate. This has a protuberance just behind the upper incisors known as the alveolar ridge. The remaining rear portion of the hard palate is a flexible muscular flap, known as the soft palate (or velum). On the floor of the oral cavity is the tongue. The tongue is a large muscular organ covered by a mucous membrane that keeps it moist and lubricated. It is an extremely strong and flexible muscle. The whole upper surface of the tongue, the underside of the front portion, and the sides are all unattached and, therefore, free to move. As air from the lungs passes upwards through the larynx and into the vocal tract there are two ways it can escape from the face. It can either pass through the nasal cavity and out of the nose or through the oral cavity and out of the mouth. The route the air takes is controlled by the soft palate. This can be raised so as to close the nasal cavity and prevent air escaping through the nose: in which case the air can only escape through the mouth. It can also be lowered: in which case the air is free to escape through both the mouth and the nose. Speech sounds that are made with the air only escaping through the nose are known as nasal sounds and speech sounds made with the air only escaping through the mouth are known as oral sounds. As the airstream escapes through the vocal tract it is modified in certain ways. The most intricate modifications take place in the oral cavity. This is because it contains moving parts – the tongue can take up different positions, the lips can be protruded or spread, and the jaw can be opened or closed. These alterations change the relative size and geometry of the oral cavity, leading to the creation of qualitatively different speech sounds. Since there are no moving parts within the nasal cavity its overall dimensions cannot be altered in the same way. This does not mean, however, that we cannot create different nasal sounds. This is possible and, in brief, it is achieved by varying the place at which the oral cavity is blocked off to cause the air to only escape through the nose when the soft palate is lowered. For example, if the oral cavity is blocked off by both lips coming together to form a seal, this makes the nasal sound /m/, as in the words men, mom and mice. If, however, the tongue tip is pressed against the alveolar ridge to create a complete seal, this makes the sound /n/, as in the words no, ban, and many.